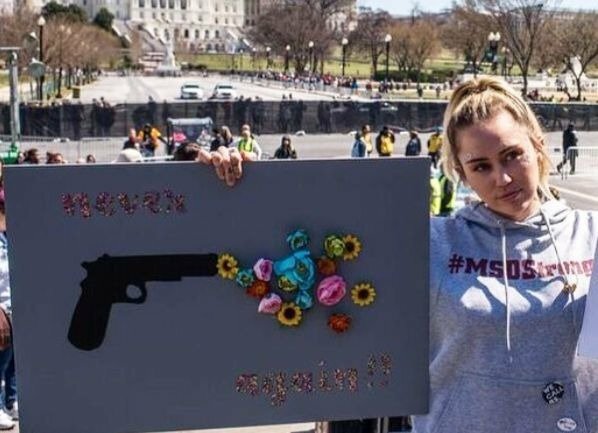 Miley Cyrus, Demi Lovato, and Ariana Grande support 'March For Our Lives' rally. Some of the world's biggest music superstars joined thousands of people at the 'March For Our Lives' rally in Washington D.C at the weekend. The rally was organised by students who are calling for tougher gun control laws in America. The student-led march follows a deadly mass shooting at Florida's Marjory Stoneman Douglas High School in February. A former learner, armed with an AR-15 style semi-automatic rifle, shot 17 people dead before being arrested by police. President Donald Trump reacted to the shooting by saying he would arm school teachers to help prevent mass shootings. A-list stars such as Demi Lovato, Kim Kardashian, Jennifer Hudson, Paul McCartney, George Clooney, and Selena Gomez - whose hit single 'Wolves' is at number 20 on the Chamberlains Top 20 - took to the streets of D.C carrying signs like "never again" and "protect kids, not guns". Several stars also performed at the rally, while some gave inspiring speeches about why America needs to change its gun laws.